where T is a strictly increasing function, Y is an observed dependent variable, X is an observed random vector, β is a vector of constant parameters that is conformable with X,and U is an unobserved random variable that is independent of X. T is assumed to be strictly increasing to insure that (5.1) uniquely determines Y as a function of X and U. 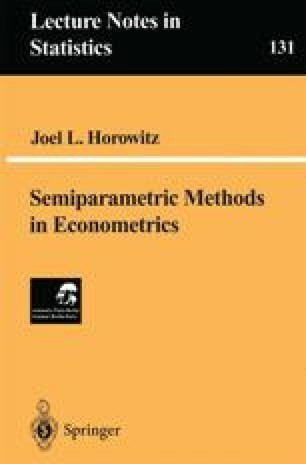 In applied econometrics, models of the form (5.1) are used frequently for the analysis of duration data and estimation of hedonic price functions. Familiar versions of (5.1) include the proportional hazards model, the accelerated failure time model, and the Box-Cox (1964) regression model.